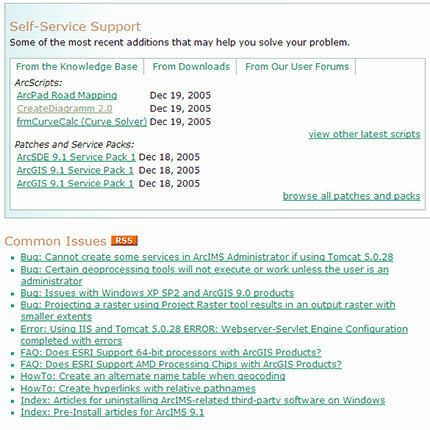 It looks like ESRI has rolled out their new support pages. It is a little easier to manage than the previous setup. The search still hasn’t been improved IMO and a search for ArcSDE still results in ESRI offering “Did you mean: arcade “. Now if they can get the backend search product up to 2007 standards, we’ll have something here. Someone on the support team needs to get on the ball and offer up RSS Feeds for the “Latest Additions” section. I’ve heard from multiple people at ESRI that they _code their RSS feeds by hand_ so I suspect that is why they haven’t offered this as an RSS feed as the person who would have to maintain this code would be busy 24/7. Most of ESRI’s RSS feeds don’t validate anyway, but that is another issue altogether.